Day 17 – traveled 130 miles by car from Eugene to Portland, Oregon. Powell’s Bookstore in Portland, Oregon. Since my flight home was leaving at the crack (the buttcrack as my family would say) of dawn on Monday morning, my sister, niece, and I trekked to Portland the day before with some planned stops – Kinikuniya Bookstore located inside the Uwagimaya Asian Market, Powell’s Books, and the Portland Food Carts. Visiting the Asian market was almost as much fun as visiting a farmers’ market. The aisles were filled with Asian foods much like an American grocery store, but with different foods and labels in different languages. They must have had at least 50 different varieties of rice which you could buy in 50 pounds sacks. The produce and fresh food section was filled with non-Americanized Asian fare. We bought some freshly made sushi which my niece promptly consumed as soon as we made it back to the car. My 15-year old nephew’s man legs (and his favorite pair of shoes). True story – He was a mere 7-months old when I (accidentally) made him cry on his first visit back to the Midwest, and the following year he was almost 2-years old when I fed him his first cookie ever (it was a setup). Seems like just yesterday yet the hairy legs are evidence that time flies. We spent most of our time at this stop in Kinokuniya bookstore which was located in the back of the market. My niece and nephew attend Japanese immersion schools through 8th grade so they are very familiar with Japanese culture, popular culture, and products. It was fun to see American magazines and books and other items with labels and text written in the various Asian character-based languages. 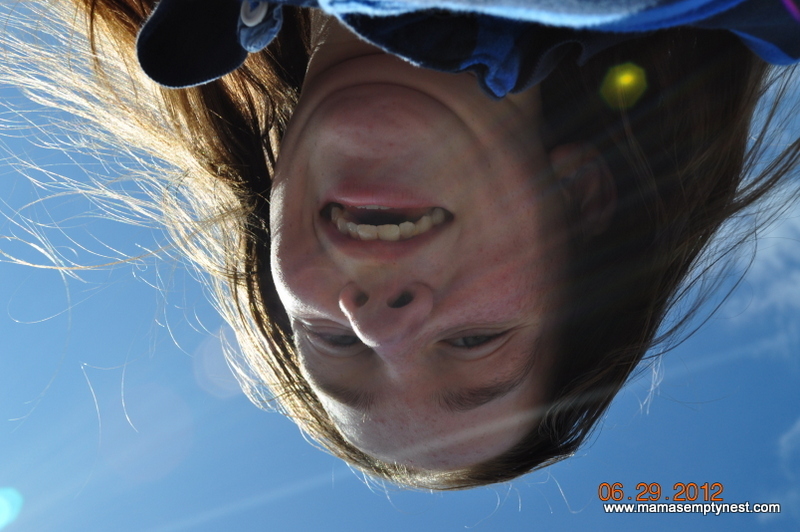 My niece took this picture of herself. She is a typical 13-year old girl with all the mood swings that entails, but when asked what the best part of our time together was she responded, “Spending time with family.” Wouldn’t have figured that with some of the teenage angst on display during our trip, but it came out as heartfelt and spontaneous. To my friends with younger children, remember that in spite of their complaining, your teenaged children really do value the time you spend with them. We then drove into downtown Portland to visit Powell’s Books. 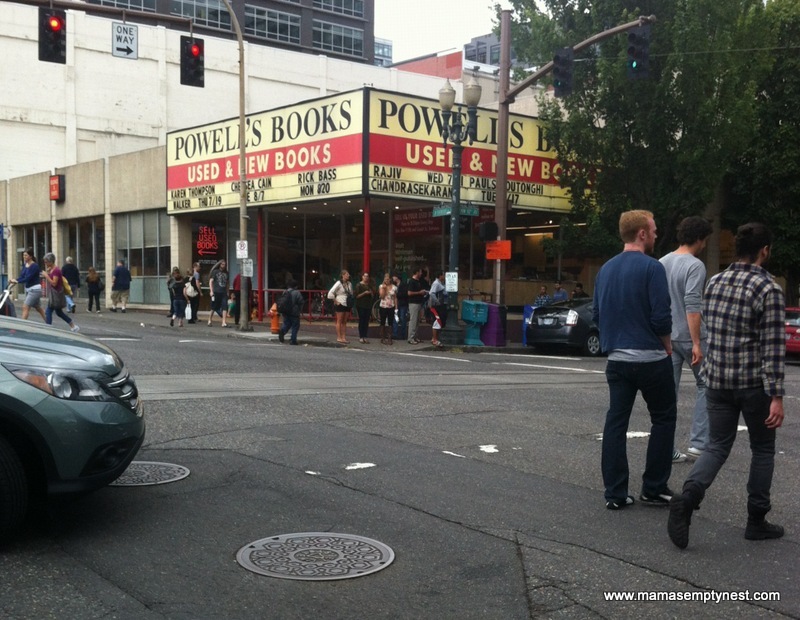 Powell’s was founded in 1971 and claims to be the largest independent seller of new and used books in the world. The Portland headquarters store occupies a full city block and is over 68,000 square feet with about 1.6 acres of retail floor space. Its inventory includes over four million new, used, rare, and out-of-print books for sale through its retail and on-line outlets. Powell’s buys around 3,000 used books a day. Powell’s established its Internet presence in 1993 and established their website in 1994 (before Amazon). Many of the used books sold through Amazon come from Powell’s, and they have contributed to each others growth. Bottom line – if you are looking for an out-of-print book and cannot find it on Amazon, go to Powell’s. I was thrilled to find several copies of The Fanny Farmer Baking Book ©1984 which has been out of print for some time now. The copy that I have, I absconded from my sister, Diane. My sister, Mary, and I each bought a copy, and I wish that I had bought the other 2 to give to my children (well, 2 of the 5 would have benefited). I spent most of my time in the cooking section salivating over the original copies of many of Julia Child’s cookbooks among others. I totally dislike shopping and am missing the woman’s shopping gene – except when it comes to hardware stores, grocery stores, farmers’ markets, and bookstores. Powell’s will be on my must-visit list from now on whenever I get to Portland. 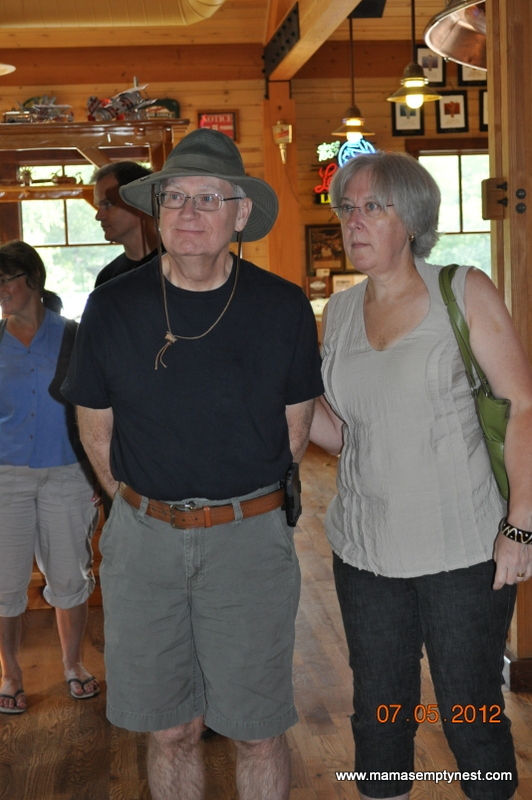 My sister, Diane, and her husband, David, who live in Eagan, Minnesota. My favorite part of the trip was that our three families, who live in three different places, were able to spend time together celebrating my brother-in-law’s birthday and lifting each other up in love. So, the last stop was supposed to be a visit some of Portland’s food carts (or food trucks as they are known elsewhere). Outside of New York City, Portland is one of the best cities to visit for its many and varied food carts. Alas, by the time we got through the Asian markets and Powell’s, it was getting late so we skedaddled our way to the hotel and an early dinner before crashing – that 3:20 a.m. wakeup call was going to be brutal. Day 18 – traveled 1,971 miles by air from Portland, Oregon, to St. Louis, Missouri. And it was. Those Southwest Airlines lines are crazy on early Monday mornings! And traveling over 8 hours with two stops and no real food other than peanuts made for a tired and crabby Mama by the time I arrived in St. Louis to be welcomed by another round of triple digit heat. Oh, those Oregon mornings in the 50s and 60s were nice. By my estimate, in 18 days I traveled over 4,625 miles by car and about 3,766 miles by air for a grand total of 8,391 miles (or 466+ miles per day on average). It’s taking awhile for my body to figure out what time zone it’s in and what times of day to eat and sleep. But, my Freaky Family Fun adventure with my Oregonian and Minnesotan sisters and their families was beyond my expectations and loads of fun. I hope everyone has enjoyed my Freaky Family Fun travelblog, and I hope everyone has also had some great fun and adventures with family and friends this Summer!